The WanderAlert system is designed as a perimeter alarm system for wandering residents in Nursing Homes. The resident at risk wears a miniature transmitter in a wrist bracelet that will activate an alarm when a nearby door (fitted with a WanderAlert Door Kit) is opened. 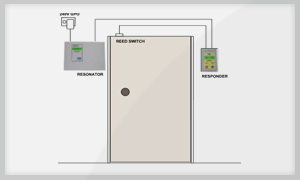 A WanderAlert Door Kit consists of a resonator and responder, connected to a reed switch on the door and a plug pack for connection to 240V power outlets. The outdoor kit comes supplied in a special weatherproof enclosure. The resonator senses the wrist transmitter when a wanderer opens the door or approaches an open door. This causes the wrist transmitter to switch on and activate the responder which generates an alarm. The alarm signal is transmitted to a nurse station alarm panel and/or connects into an existing Nurse Call system. The WanderAlert Door Kit can also be used as an after-hours door security alarm.